Currently viewing the tag: "INTERNATIONAL SECURITY"
General James Cartwright as VJCS. 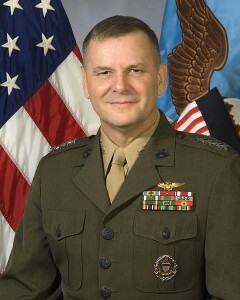 Having had the privilege to meet, hear speak, and ask questions of General James E. Cartwright (USMC, Ret.) when I found this video it was A Cyber Fellow’s treat! The video is from the Global Security Forum 2012. One of the panels addressed the big aspects of Fighting a Cyber War to include significant strategy and policy discussions in Defense and International Security, Technology and Cybersecurity. Several years ago at an AFCEA IT conference while he was serving as Commander, U.S. Strategic Command, I asked a question relating to the significant slowness of technology to penetrate the U.S. Military for use by our Forces. His retort, “it is a massive problem,” quite accurate from what I’ve learned about the issue since – he even offered me his shoes if I wanted to take his place (Navy LT (O3) to 4-Star (O10) would have been a significant jump). The problem is quite massive and at the root of our Military’s desire – Innovative, Highly Technical, Entrepreneurial, yet Inspirational and an Effective Leader – the perfect warfighter! The Global Security Forum 2012 is a forum on the top challenges facing U.S. and global security. The vulnerability of military, civilian, and commercial networks to cyber attack is forcing the U.S. government to revise its approach to cyberspace. While most attention is focused on preventing attacks, this panel will address how cyber could be used in an offensive capacity, including how to conceptualize command and control, targeting, damage assessment, proportionality, and deterrence in a cyber environment either alone or alongside kinetic operations.